When I was in college, I loved my philosophy classes probably the most. 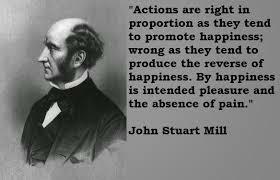 If you don't know much about John Stuart Mill, he was a British philosopher who wrote extensively about liberty--mostly political stuff I wasn't all the interested in. No, I don't agree with a whole lot of what he said, but one John Stuart Mill quote has remained in my mind since I was in my 20s. It is shortened here (because Mr. Mill liked to write REALLY long sentences). He said: “... happiness… was not a life of rapture, but of such, in an existence made up of few and transitory pains, many and various pleasures ... and having as the foundation of the whole, not to expect more from life than it is capable of bestowing.” Sounds a little bleak, I know. To me, he is saying there are limits to what you can expect because, well, you are human and circumstances are not completely in your control. Simplified and taken out of context, but that's how I chose to interpret it. I faced my humanity this past week after the disappointment of missing the NY Times bestseller list for the first time in five years. See, you will always hear the truth from me. I tell the truth in my books and share who I am with the world. Sometimes disappointment is just around the corner and will smack you hard. It's one of those "transitory pains" that Mr. Mill spoke about. It will tarnish happiness. But it is to be expected. Were there 18 other mass market paperback cozies released from my publisher alone this month? Yes. Did Amazon choose to discount 14 out 18--deep discounts, mind you--in its price war with other folks who sell books? They did. Was my book one of those discounted? No. But my good friend had the same circumstances and she made the list. I am very thrilled for her, but the other consequence of this perfect negative storm for me was that it sent me into a downward spiral and I could not write one word on next year's book for days. I am an emotional person and I took this very hard. Harder than I should have. My editor always says she cares nothing about lists, she cares about long term sales. Still, it made my heart hurt and sent me hunting for all those wise words from people far smarter than me who all seemed to have lived a long time ago. Smart people often help me right my crazy ship. It is okay to be disappointed, but I did nothing wrong. Books are like babies, after all. They take a long time to grow big enough to be born, they require much care and feeding and love. Does this mean I love my baby--I mean my book--any less because it didn't do what I expected? Of course not. This was a lesson I needed to re-learn. It's called humility--or as the wise man said, "...not to expect more from life than it is capable of bestowing." If I depended on the NYT's bestseller list, to determine what I read, I'd never read. I love your series and loved The Cat, the Sneak and the Secret! You are a bestseller on MY list! I have a couple of thoughts. First, I purchased your book full price from Barnes and Noble. I'm not in favor of Amazon's deep discounts because I think they devalue the hard work that goes into writing a book. In addition, I honestly don't value a book I bought for .99 or 1.99 as much as I do one that I paid the full price for. There is no logic to that because the .99 one often is superior to the 21.99 book. However, I don't believe I'm alone in this inconsistency. Second, if an author has to practically give away her/his work in order to get on the NYT list, then it may not be worth it. I have never purchased a book just because it was on the NYT. So, just keep on writing and your loyal fans will keep on reading. Finally, don't compare yourself to other situation, no matter how hard that is to not do. The friend you mention publishes more than one book a year so her name is out there perhaps a bit more than yours is. That doesn't mean that your work is not as good. I'm a novice writer and I understand how hard we judge ourselves and how hard it is to write. Just being published is in itself a huge accomplishment. Thank you for your books! Thanks Naomi. You are very wise. I think I needed to write this blog so I could let go of being so down on myself. This always seem to happen after a book release or after I turn in a manuscript. Creative people often have dark times but it always seems to be so unexpected. Go figure! Thanks again and good luck with your writing. I had that same disappointment with my last release, A ROOT AWAKENING, also after 5 years of making the list. It stings!! My editor, too, said comforting things, and I think it wouldn't have hurt so much if I hadn't made it before. But oh well. Life goes on and hopefully so will our books. Thanks for sharing this insight with readers, Leann. Thank you Leann for consistently writing a wonderful book and series that I enjoy. You do good work that entertain and satisfy my reading pleasure. 1. That first picture of John Stuart Mill looks like Datak Tarr on Defiance. 2. I read somewhere to talk to yourself as if you were talking to your friend. You wouldn't be as hard on her. 3. I didn't even know there were cozies on the list! Thanks Dru. And thank you for all your amazing support. You help all us "little" writers shine with your blog. Bless you for that! Thanks Sally. I do have to be kinder to myself and if I could myself a hug--or YOU a hug, I would. It is all grist for the mill as I write. If there weren't disappointments, joy wouldn't be as sweet. Thanks so much Traci. It's all good now that I have thrown up all over the blog!! LOL. I needed to get it out and it has lifted a weight off my shoulders. I expect a lot of myself and I will continue to do that so I won't ever let down readers and friends like you! I've only been able to read the first book in the Cats in Trouble series but it was so much fun that I know I'll be getting the rest of the series. I only just discovered how enjoyable it is to follow my favorite authors on social media. Now I can also see the this provides you with a support system when life "happens". I used to glance the "list" but since I've met so many cozy authors, I'm never at a loss for a good read. I'd rather pick an author based on his/her social interaction than a "list" any day. Remember that your characters give so many people joy...the characters aren't worried about hitting a list either. Leann- I am currently about a third of the way through The Cat, the Sneak and the Secret. You are an automatic buy for me! I don't let Amazon control my buying habits. I buy because I like the way an author writes and story lines that appeal to me. I'm so sorry to see this. You are among a small group of authors that I always have on pre-order. I never look at the NYT lists and only know when someone I care about has "made it" when I see a post about it. I just started The Cat, the Sneak, and the Secret last night and immediately cried at the dedication. Having read your updates as you went through all his medical difficulties, I felt like I personally lost a loved pet. That means more to me than any list in the newspaper.